If you like a spot of history coupled with narrow cobbled streets, painted doors, flakey yellow paint on crumbling buildings and some delicious smells emanating from local restaurants than an afternoon in the la zona velha Funchal is definitely up your street! 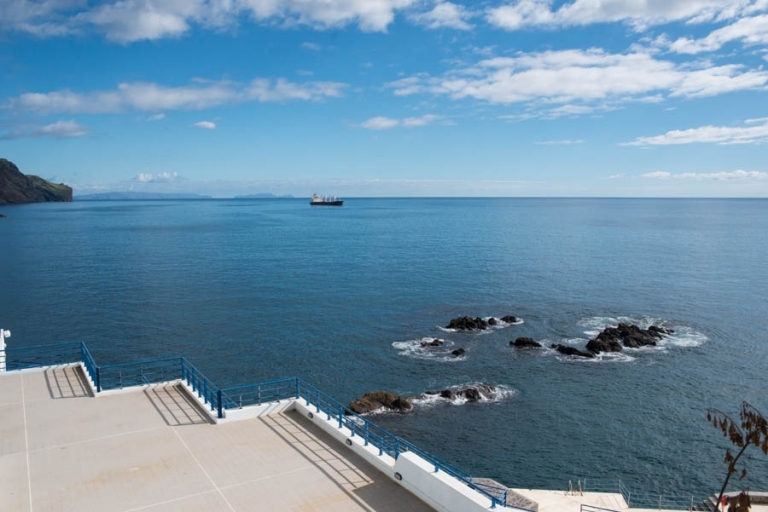 The view from the top of the bathing complex. 1.8 Can you catch a tukxi? 1.12 What else can you do on Madeira? La Zona Velha or The Old Town of Funchal is a tourist hotspot but nevertheless still worth an afternoon’s visit. 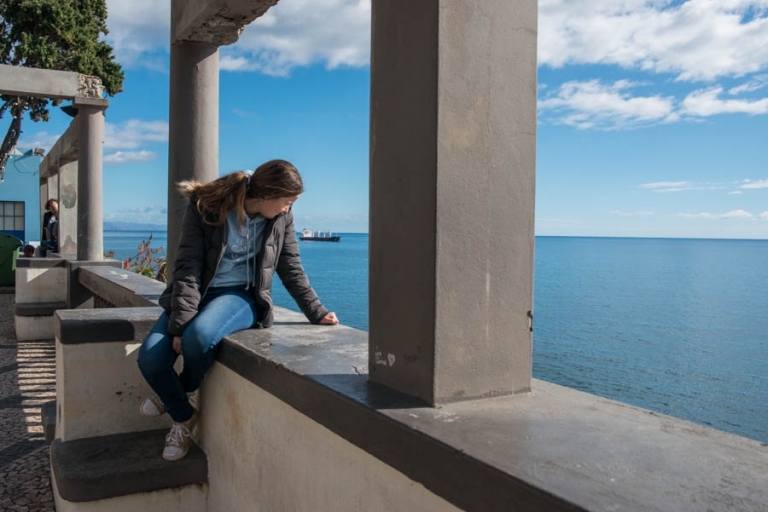 If you start in the east with the Fortaleza de Sao Tiago, you can then explore the streets, take a nosy in the churches, stop off for afternoon tea, visit the story centre and learn all about Madeira’s history, possibly pop up to Monte on the cable car and then meander your way west along the Avenida do Mar walkway to Funchal’s marina. Parking on the Rua Bela Sao Tiago opposite Ilha Pneu Tyres (GPS: 32.647713 16.896714) parking for 7 hours cost us €3.40. Parking is open until 11pm weekdays, midnight Friday night and 1am Saturday night. The Barreirinha Bathing Complex is just east of the fort, on the Largo do Socorro. 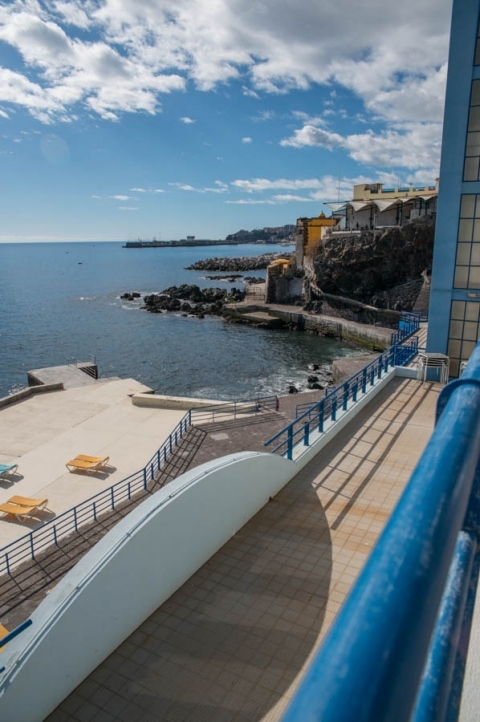 It’s a fee-paying, public area and costs €4 euros entrance and is monitored by a lifeguard. We didn’t go into the complex but we were able to walk around the top areas. Despite it being 24*C (48f) that day, there was just ONE person sunbathing in the complex. Imagine having all of that to yourself. The rugged coastline and the yellow turret of the Forte. The view of the bathing area and the sea. The forte and its coastline in the zona velha. As the Portuguese dominated the North Atlantic routes in the 1500’s they omitted to consider defending Funchal and Madeira. This oversight led to a bloody battle in 1566 where many Madeiran’s were slaughtered. The fort’s construction was finished in 1614 despite the constant threat of attack. It was enlarged in 1767 and used exclusively by the military until 1992 when it was then used for cultural activities. The inside of the fort now houses an art gallery and a restaurant whilst the outside is used for local fishing boats and sunbathers. The small but rocky coastline provides rockpools and a free area for people to worship the sun! There are toilets and this is where local fishermen dry dock their boats. A sign for the forte that leads down a narrow cobbled lane. A turret on the west wing of the fort. The rocky coastline and pools. La zona velha is nearly entirely formed with cobbled streets, some of which are pedestrianised and some of which you share with cars. You can hear them approaching because of the constant thud noises they make over the cobbles! The Church of Socorro, located in the Socorro Square (Largo do Socorro), is associated with a vow to São Tiago made by the Funchal population in 1523. It was originally located somewhere else but was destroyed and relocated here in 1768. We didn’t go in and I am unsure as to whether it is open except for services. The doorways on and around the Rua da Santa Maria date back to the 1400s. Thanks to the art project “Art of Open Doors” (Arte de Portas Abertas) many doors and entrances were revamped and decorated. I missed quite a few including one of a mermaid so we might have to re-visit! The park straddles the front of la zona velha Funchal. Walk around and you can see men playing cards, stray dogs, families, young people on bikes and more. It is all very vibrant with lots going on. Can you catch a tukxi? At the heart of the old town, you can catch a tukxi. An eco tour of the old town costs €50 for 3 people and takes 90 minutes. You can create your own tour too! Obviously we couldn’t as we are five but they have good feedback. We stopped off for some tea and cake at this delightful tea room which is directly opposite the teleferico. Google is not very good on Madeira and many businesses are not listed. I had coconut cake and passion fruit tea. It was delicious. The inside of the tea room. You can catch the teleferico from the park of Almirante Reis up to the Monte Tropical Gardens or you can just sit and watch them fly past. Tickets are relatively expensive. A return ticket is €7.50 for kids aged 6-14 and €15 adults. Under 6’s go free. We were lucky enough to be given two tickets from a Dutch tourist who had bought tickets and then changed her mind. Thank you to that wonderful person. From here you might as well just carry on walking if it’s a nice day. We had beautiful sunshine and decided to walk on to Funchal’s marina. 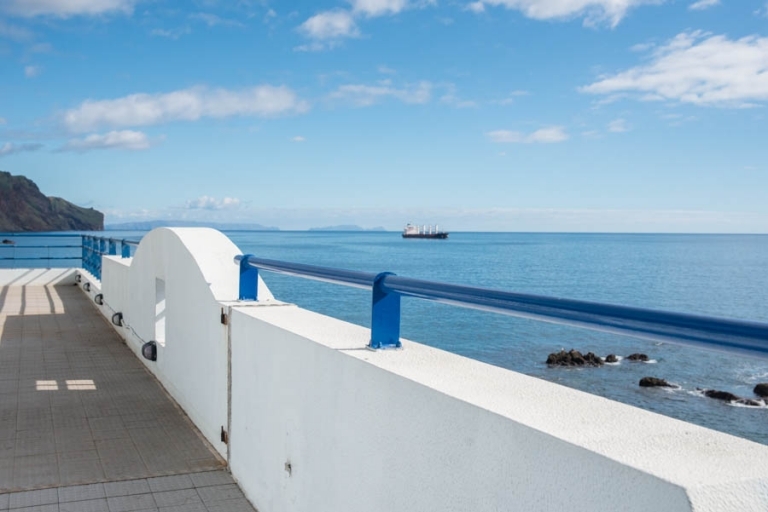 The promenade has some nicely laid gardens which lead you up to the marina where several boats are docked and some small stalls sell freshly cooked food. Walking to Funchal. The yellow fort in the background. This shopping centre has a large girl painted on its side. What else can you do on Madeira?